Even if your appreciation of opera stops with Elmer Fudd and Bugs Bunny in Warner Brothers' parody of Richard Wagner's opus, there's no denying it's easily the most dramatic of the musical genres. I wasn't even good enough to make the cut for my fifth grade choir (true story), so I find the unbelievable notes hit (and held) by those with the talent to sing it particularly awe inspiring. You didn't really think I'd be hiding a boring pair of pumps under the lace train of my gown, did you? These crystal encrusted sandals are by Nina and come in different colorways. I can't sing a note, but I like to think I can dress a good game, so I brought my own kind of drama to this weekend's Indianapolis Opera Ball. When I found this Tadashi Shoji gown last January, I fell hard for the nautical theme of the heavily embroidered, sheer lace. A parade of mermaids surrounded by starfish, angelfish, seahorses, anchors, compass roses, and seashells graces the bodice from head to toe. I had never seen anything like it, though it looks like it might have come straight from the art nouveau era. Indeed, several people have asked if it's vintage, but it was actually part of the designer's 2015 resort collection. At the risk of gilding the lily (because we all know I'm not much of a moderation girl), I couldn't resist the opportunity to wear a dramatic headpiece by my favorite milliner, Loreta Corsetti. I've treasured this one of a kind piece of art featuring a traditional birdcage veil modernized with hand-strung irridecent glass beads for a few years. I've worn it for other events with other ensembles, but I think I love it even more with this dress, especially with the temporary addition of crystal-encrusted metal shells and starfish to extend the nautical theme, literally, from head to toe. 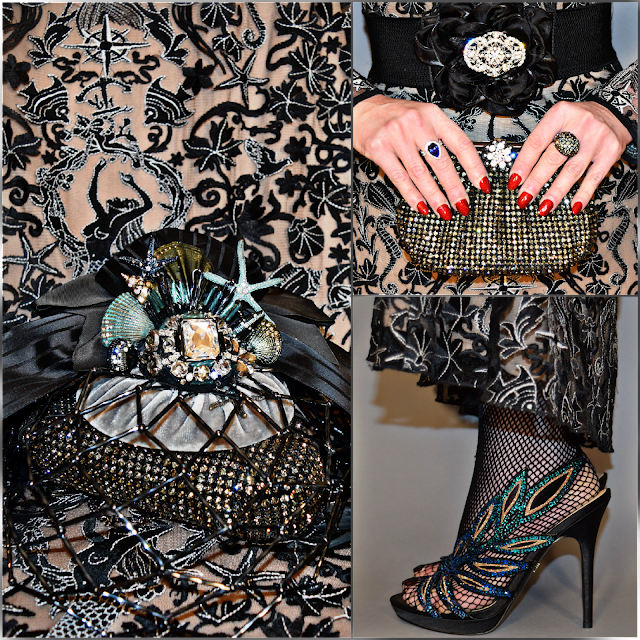 The seaworthy embellishments were originally part of a necklace, but I used a small pair of jewelers' pliers to take it apart and repurpose it for this look. I hope Loreta agrees it was a perfect modification of her genius for this particular ensemble. 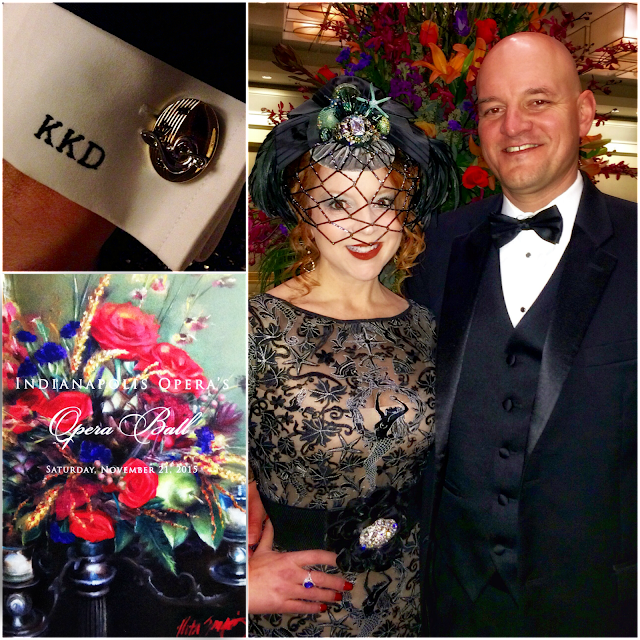 The ball itself was a splendid event: elaborate centerpieces in the rich colors of the Season; a meal that exceeded "fundraiser" expectations; two excellent bands; a stunning performance by two up and coming sopranos who got their start in the Circle City; and the company of friends and colleagues that make me smile in any environment. 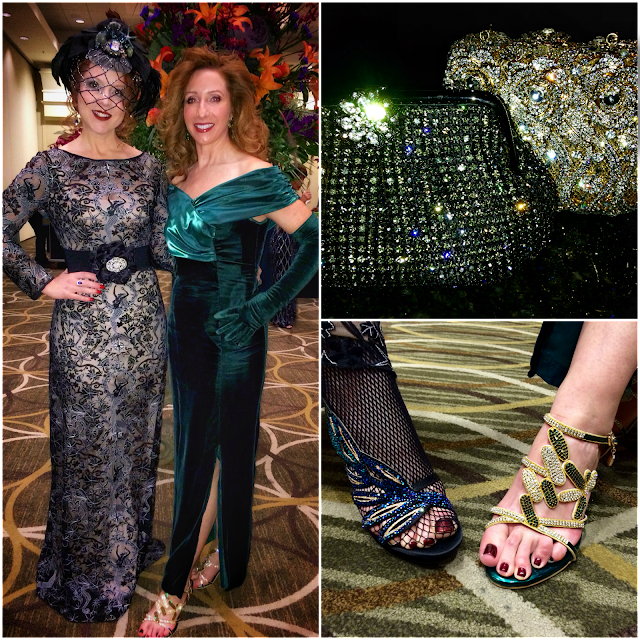 My friend Yolanda brought glamour to her hunter green velvet dress with coordinating velvet opera gloves; a crystal-encrusted gold minaudierre; and dazzling green crystal heels from LittleBoutique (I have similar LittleBoutique heels in grape). I'd be remiss if I didn't also give a shout-out to Becca at my favorite local salon and spa, Studio 2000, for creating the perfect pin curls to complement my chapeau! Likewise, many thanks to Indianapolis photographer Faith Blackwell for providing a fun "pre-party" opportunity to gather with friends in her near-downtown studio for sips, snacks, and (professional) snapshots that remove any desire for tableside selfies in a dimly lit ballroom - something to think about next time you're all gussied up! KDef didn't neglect the details, either, accenting his classic Ralph Lauren tux with music-themed cufflinks that once belonged to my Dad. If you love exotic headpieces, check out The Style Crone's Hat Attack,too! I've just found you on Hat Attack - just want to say what a simply fantastic dress - amazing. You look lovely! Thank you so much, Penny! I love the way Judith's Hat Attack brings us all together! You are a showstopper in your gorgeous gown and headpiece. I admire your art and how you create ensembles with panache. 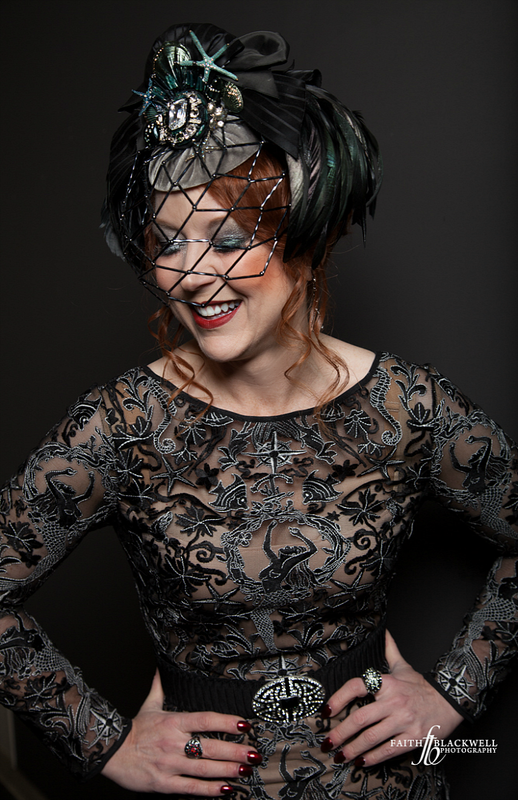 Thank you for sharing your beauty and your headwear with Hat Attack!